Toning: Toning vowel sounds, beginning with a deep 'OO'. Groaning helps to relax the body. Feel the sounds resonating in different areas of your body. Four Directions Exercise: Turn and face each direction as you connect with the quality of each direction. Laughter Exercise: Making laughing sounds releases tension and is very relaxing for the body. Harmonics Exercise: Creating vocal harmonics is healing and uplifting. Listening to higher harmonics takes us into altered sates of consciousness. It is easy to create harmonics by moving from an EE sound to an OO sound. Sa Re Ga: We can use the sounds of the Indian Scale to move energy up the chakras. This helps to release energy that is blocked in the spine. This practice also balances the chakras. Begin by toning SA to connect with the base chakra, then sing the scale up the chakras. Sound Bath: One person lies down. We begin with a prayer to set our intention. The group tones healing sounds over the person lying down. The group sings the person's name with love to conclude the healing. We finish with a prayer of thanks. Gong Bath: Gongs have been used for healing of thousands of years. In a gong bath a person lies on the floor while healing gongs are played around them. Himalayan Bowls and Tingshas: Himalayan Bowls create a wide range of harmonics that have a healing effect on the mind and the body. Tingshas are Tibetan cymbals. Listening to them clears the mind of unwanted thoughts. Grounding Exercise: At the end of all sound healing exercises we always finish with a grounding exercise. This enables us to integrate the healing that has taken place and to continue your day in a positive state of mind. NOTES: Exercises 1, 2, 4, 5 are taught on Part One of the Sound Healing Training. The Sound Bath is experienced on Part One and Part Two. The Sa Re Ga Exercise is taught on Part Three. Sound Healing with Gongs and Himalayan Bowls are taught as Additional Modules. Barima Tue Tue, Barima Tue Tue. 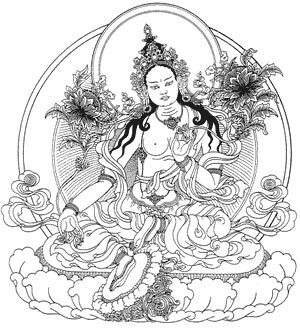 Tara (whose name means "star" or "she who ferries across") is a Bodhisattva of compassion who manifests in female form. In Tibetan, Tara is known as "Dölma" (Sgrol-ma), or "She Who Saves". In particular she represents compassion in action, since she's in the process of stepping from her lotus throne in order to help sentient beings. According to Sangharakshita, a traditional explanation of the mantra is that the variations of her name represent three progressive stages of salvation. 1. Tare represents salvation from mundane dangers and suffering. Tara is seem as a saviouress who can give aid from material threats such as floods, crime, wild animals, and traffic accidents. 2. Tuttare represents deliverance into the spiritual path conceived in terms of individual salvation. In traditional terms, this is the path of the Arhant, which leads to individual liberation from suffering. 3. Lastly, Ture represents the culmination of the spiritual path in terms of deliverance into the altruistic path of universal salvation - the Bodhisattva path. In the Bodhisattva path we aspire for personal enlightenment, but we also connect compassionately with the sufferings of others, and strive to liberate them at the same time as we seek enlightenment ourselves. Soha means: "it is so". I am of the Great Spirit, it is so. It is so, It is so, it is so, it is so.